connecting cst terminus to flora fountain, d.n. road is an arterial road, a business hub and a heritage mile at the same time. its multiple roles overlap especially during the busy weekdays. besides shops and offices, its usually choc-a-bloc with vendors, hawkers, shoppers, commuters and tourists. come weekends however, and the streetscape changes - the arcades are empty, the doorways shut and the streets eerily silent. this vendor had however set up his stand at 8am on a sunday morning. 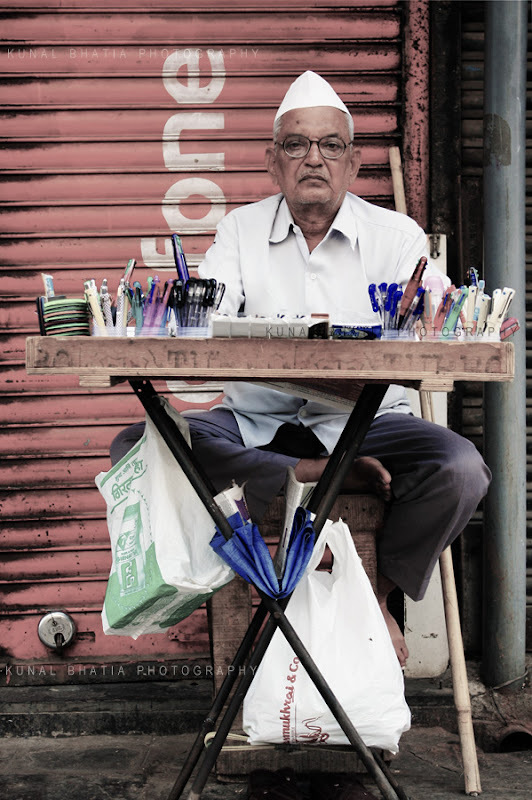 with pens, diaries and other stationery items filling up his stand, office goers would be his prime customers. sundays are probably his least active days, but he's still there nice and early. that's called dedication. something to admire and to be inspired from. find this photo on flickr and on facebook.